The sudden death of Alan Jupp at the age of 74 shocked all who knew him. Alan suffered a stroke whilst playing tennis for Austwick in a Winter Vets League match at Heversham on Monday February 25 2019. He was taken to hospital in Lancaster and appeared to be making a good recovery, but sadly died the following day. Our thoughts and condolences go to his wife Angie, daughters Michelle and Kerry and the whole of his close and loving family. Alan joined Austwick Tennis club when he and Angie moved to the village in 2009. Though the two of them spent several months a year at a house they owned in Provence, they played a very active part in the life of the village whenever they were here. As well as playing tennis, Alan helped organise a Tuesday walking group and Thursday table tennis sessions in the village hall. He played for the C team in the Wharfedale League and greatly enjoyed participating in the winter league which we joined last year. He was also a regular at the Mon-Fris social tennis, a group that meets on Monday and Friday mornings throughout the year for tennis and coffee – though highly sociable Alan’s preference was always for play rather than chat. An active sportsman throughout life, his tennis was always competitive but fair, if he thought his best shot was just out he would always call it even if his opponent was in doubt. 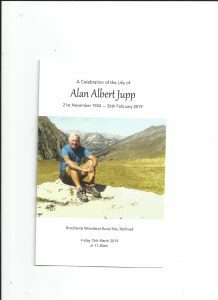 Many club members were among more than a hundred family and friends who attended a humanist celebration of Alan’s life held at Brocklands, near Rathmell in the Yorkshire Dales before his burial at the Woodland Site. Alan was born in Edmonton North London on 21 November 1944. He was a skilled footballer and had trials for Arsenal, Tottenham and Watford before going to teacher training college in Dudley. It was there he met Angie – the two celebrated 50 years of married life in 2017. Alan specialised in special needs teaching and helped many pupils to overcome difficult childhoods. After many years in teaching he decided late in his career it was time for a change and he and Angie opened a shop in Swanage selling furniture made from reclaimed wood. Eventually they retired and moved to Austwick, close to where their daughter Kerry lived. The club has joined many of Alan’s friends in making a donation in his memory to the Stroke Association and Children in Need.